Modern life is full of stress. There are deadlines to meet. Quizzes to take. Angry parents to soothe. It seems like everybody wants something from you. 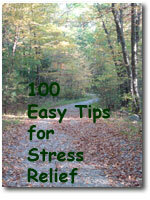 Here are 100 simple, easy ways to help manage your stress and anger levels. Stress can damage every aspect of your life. It can cause you to lose sleep, to become irritable with family and friends, to sour relationships with your teachers, bosses, and anybody else you come into contact with. It can destroy relationships with loved ones. Learning how to manage stress can not only save the love of those near you - it can literally save your life, by warding off serious health issues. This is a coping skill that every person needs to master.